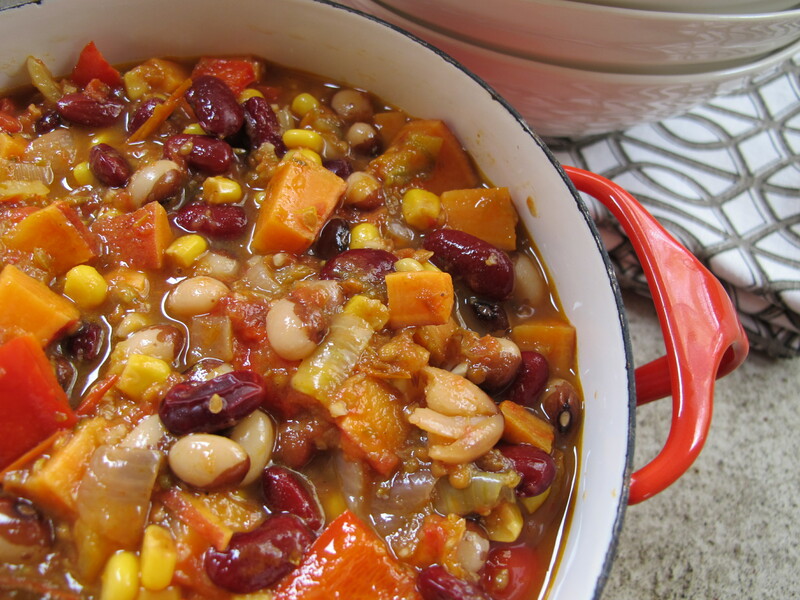 Last week I saw 3 or 4 different recipes for sweet potato chili in different places. Weird but wonderful. I decided to shamelessly follow the trend and post my own. Sweet potatoes go over big in our house, and as we head into the depths of fall, it’s always good to have a recipe on hand that can warm the heart and brighten up even the darkest of November nights. And don’t be jealous of my authentic vintage red Dansk dish, this chili looks good in any pot especially with a healthy garnish of cilantro and green onion. Heat the oil in a heavy pot or dutch oven over medium-high heat. Add onions and peppers and saute for about 8 minutes until they turn soft and brown. Stir in the garlic and spices. Reduce the heat and cook until everything turns fragrant, about 2 or 3 minutes but be careful not to burn the spices. Stir in the corn, beans, stewed tomatoes, sl0w-roasted tomatoes (if you have them, if not don’t worry), and sweet potatoes. Bring to a boil, then reduce heat and let simmer for about 30 minutes until flavours meld and the liquid boils down a bit. Add sea salt and pepper to taste. Serve alone or alongside some rice. Garnish liberally with chopped cilantro and chopped green onion.